April is the fourth month of the year on the Gregorian Calendar. It's name is derived from the Latin word "aperit" which means to open...so named because of the time of year when trees bud and flower "open." April is also considered to be linked to Aphrodite, the ancient Greek goddess of love, beauty,pleasure, and procreation. 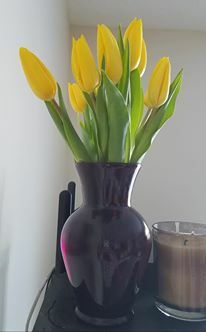 I love this month, not only because my 2nd son was born on April 1st, but particularly because my favorite flowers usually bloom--iris and tulips. In the Skagit Valley of Washington state, there are tulip farms...fields and fields of color this time of year. It's always been my passion to see those fields. 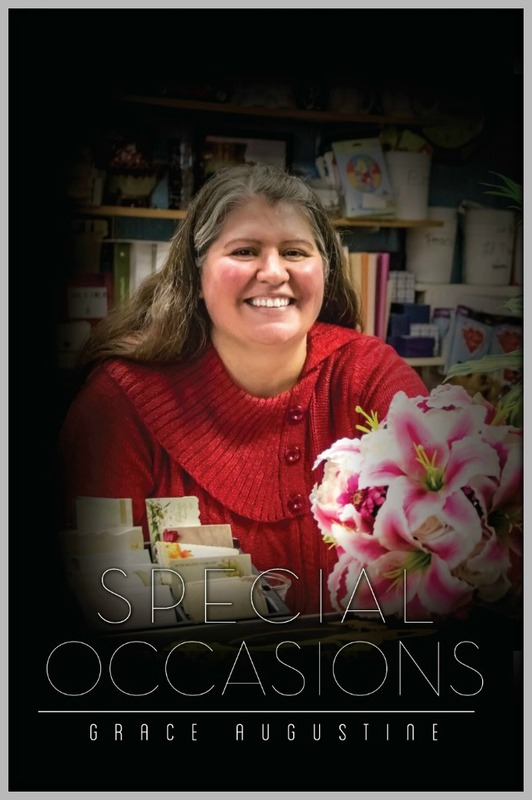 For thirty years I was a floral designer and shop manager. I loved anything floral, working with the customers to create one of a kind arrangements that would suit their needs--whether it be for a birthday or in memory of a deceased loved one. The final book of my Acorn Hills Series, Special Occasions, is about Jillian, a floral designer who embarks on a new path at the age of 60 something. In a memoir to her children, Jillian recounts her life....here is an excerpt. "As I sit here glancing out the window, the world thirty-eight thousand feet below me, I marvel at all of the firsts I’ve experienced. The summer of 1963 we got our first black and white television. I was seven years old. Our world was shattered in November of that year with the assassination of President John F. Kennedy. School was dismissed and it was eerily quiet everywhere as everybody was glued to their televisions with the hopes the news wasn't true. I was too young then to understand its impact. In February of 1964 the Beatles made their first American television appearance. Yeah, I know…who are the Beatles? I chuckle as I write that, because I remember both of you asking me who they were when I sang along to their music. What was more heartwarming...the fact you love them, too. The Vietnam war was already in high gear in 1964, and we’d lost close to 300 soldiers. I cringe when I remember seeing the events in Times Square and the marches protesting the war. It was an ugly time, a senseless time. I entered junior high school in 1967. The world was still a mess. The Vietnam war waged on…thirteen of our military helicopters were shot down. While all of this was going on thousands of miles away, here in the states, Timothy Leary, the father of LSD, told people all they needed to do was turn on, tune in, and drop out. I did none of those. I’m sure your Grandpa and Grandma Stevens experimented with the little pill, though. In the late 60’s and early 70’s, music festivals were popping up everywhere. Probably the most memorable one was in 1969…Woodstock, when over forty thousand people descended on White Lake, New York for a three-day music/love/drug fest. I wasn’t interested in that one. It was too far away. I wanted to go to the Monterey Folk Festival in Monterey, California. I remember pleading with your grandparents to let me go. I wanted to meet Janis Joplin, Jerry Garcia and the Grateful Dead, Gracie Slick and Jefferson Airplane. They said no, of course. I never got to do anything fun. Sound familiar, boys? Gas prices were fifty-five cents per gallon in 1974, and the SLA had kidnapped Patty Hearst. I was a senior and your grandparents were planning my graduation party. Your dad and I had been dating for a while at this point and we decided we’d apply to colleges in Montana. We were accepted and for the next 5 years we spent our time traveling from Bozeman to Acorn Hills. In the midst of the global, ecological awareness in 1978, Sweden became the first country to ban aerosol sprays. A brutal serial killer, by the name of Ted Bundy, was captured in Florida. Pope John Paul II, the only Polish Pope, became the Holy Father of the Catholic church. Probably one of the most senseless things to happen this year was the loss of nine hundred and eighteen lives because of Jim Jones and his poisoned kool-aid promise of a better life."